At the closing event of its European Union funded project “Developing marine protected areas and an ecosystem management approach to Fisheries in the Mano River region, with special focus on Sierra Leone and Liberia”, in Robertsport, the Environmental Justice Foundation (EJF) is, today, reaffirming its commitment to supporting Liberia’s fishing communities in their efforts to build sustainable fisheries across the country. Today, EJF will be joined by representatives from the European Union, the Liberian Government and groups representing Liberian artisanal fishermen to examine the lessons learnt from the five-year project, and next steps towards further strengthening and protecting the country’s fisheries for both current and future generations. The fishing industry is vital for West Africa. In Liberia, 65% of animal protein comes from fish, making it the second most purchased food after rice. 33,000 people are directly dependant on the sector for their employment and income. But the industry is under threat as illegal ‘pirate’ fishing costs West Africa in excess of $1 billion every year. As much as 37% of all fish caught in the region’s waters is done so illegally, putting the livelihoods and food security of millions of people at risk. Over the past five-years, EJF and its partners have achieved historical milestones towards ending illegal activities, securing marine conservation and building sustainability in the region’s fisheries. Working in Sierra Leone and Liberia to document and combat pirate fishing, particularly in the Inshore Exclusion Zone (IEZ) - an area reserved for artisanal fishers - we have seen an increase in action taken against vessels fishing illegally. This has led to a reported decline in illegal fishing vessels and, in turn, an increase in catch for artisanal fishers, an improvement in their livelihoods and a reduction in conflict with industrial vessels. Over the course of the project, the organisation has also worked with local fishing communities to establish decentralised fisheries management. In Liberia, EJF helped set up the Collaborative Management Association (CMA), an organisation made up of primarily fisherfolk that now manage their own Territorial Use Right for Fishing (TURF) area in Grand Cape Mount. In Sierra Leone, EJF also worked with local co-management associations to establish a new Marine Protected Area around Sherbro Island. 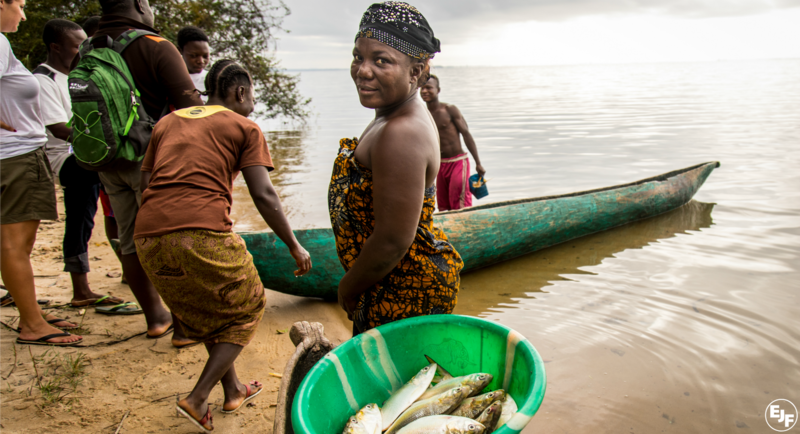 In Lake Piso, Liberia, EJF worked with local communities to establish a Fishery Management Plan for the Lake Piso Multiple Use Reserve. This plan, together with information on Liberia’s vital marine species, is helping to improve the sustainability of Liberia’s fisheries management and inform future policy. EJF aims to continue to support the CMA and other local efforts, and hopes to use the examples set over the last five years to expand capacity across the country. On 7 June 2017, EJF is organising the closing event of its five-year, EU-funded programme: “Developing Marine Protected Areas and an ecosystem management approach to Fisheries in the Manu River Region, with special focus on Sierra Leone and Liberia”. Faced with large-scale Illegal, Unreported and Unregulated (IUU) fishing, and its devastating impact on coastal communities, the project aimed to reduce IUU fishing in the area, empower local people to take part in decentralised fisheries management bodies and promote the legislative reforms that guaranteed coastal protection and improved fisheries sustainability. A new Marine Protected Area (MPA) was created around Sherbro Island, Sierra Leone in May 2012 involving Community Management Associations in its management. EJF provided extensive training for community associations, equipping them and empowering local leaders to be the voice of their communities. In Grand Cape Mount, Liberia a Territorial Use Right for Fishing (TURF) was created in November 2013 where the fisheries resources are co-managed by the local representatives organised in a Collaborative Management Association (CMA). EJF has accompanied the CMA, trained and equipped them and is still supporting them with a permanent presence in the field. The community surveillance programme established by EJF, where local information was combined with satellite monitoring undertaken from our London offices and international advocacy has led to an enormous decrease of IUU activities within the IEZ and consequently to higher catch and better incomes for coastal populations. In Lake Piso, EJF has recently finished the “Fishery Management Plan for Lake Piso Multiple Use Reserve” and is currently gathering the fish catch information around the lake. The results of this survey, together with the biodiversity information on charismatic species landed in different places along the coast of Liberia, will be the base of a new assessment report. According to the Bureau of National Fisheries (BNF) there are approximately 3,300 canoes and more than 11,000 fishers operating from 114 fish landing sites along Liberia’s 579km coastline and about 33,000 people directly dependant on marine fisheries for their employment and income. 65% of Liberia’s animal protein comes from the fishing sector according to the UN Food and Agricultural Organisation and some 80% of the population depends on cheap fish for their main source of protein intake according to the World Food Programme. According to the Global Hunger Index, 31.9% of Liberia’s population is classified as undernourished, while 16% of families are classed as food insecure by the World Food Programme. The World Food Programme also found that 83% of the population live on less than US$1.25 a day.